Ascending Butterfly: Today's Words of Inspiration and Great Giveaways! - ♥ Ƹ̵̡Ӝ̵̨̄Ʒ ♥Happy Butterfly Valentine Weekend! Today's Words of Inspiration and Great Giveaways! 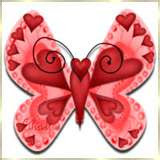 - ♥ Ƹ̵̡Ӝ̵̨̄Ʒ ♥Happy Butterfly Valentine Weekend! Do you remember how much fun Valentine's Day was when you were a kid? Who got your paper heart back then? Was it your crush? Your BFF? A few 'Besties'? I got my first paper heart in Kindegarten from a very sweet boy in my class, it was a very bold move for him because he was so shy! From the heart gestures are still the ones that rule with me. Remember Holidays are only as commercial as you make them! In this recession, the old 'coupon book' standby and today's 'mixed tape' equivalent, the 'playlist' are silly, fun and endearing ways to show you care. Showing love doesn't mean going into debt! Don't forget to show some love to your FIRST Valentine, ahem.....YOUR MOM! Also, Try to remind your sweetie how much you love them everyday, and be sure to fill this weekend with romance! Remember why you both fell in love in the first place! No sweetie this year? Then enjoy some 'single and mingle' fun this weekend, the universe can't send you romance if you don't put yourself out there! You are all my Valentines! Wishing you all a magical weekend. Wishing you stars in your eyes. Songs in your heart. Music for your soul. Good Company and better still endless Possibilities! Hi. I am a new follower from MBC. What a lovely thought for the day and a lovely blog. Thanks for following Secret Story Time. Your blog is nice, the Valentine message is good, I'm following you too.